While inspecting lots of samples of dull dark petrified wood, hoping in vain to see some detail of anatomical interest, one greets even an uncanny apparition like the one seen here as a welcome surprise but only as long as one does not try to explain it. 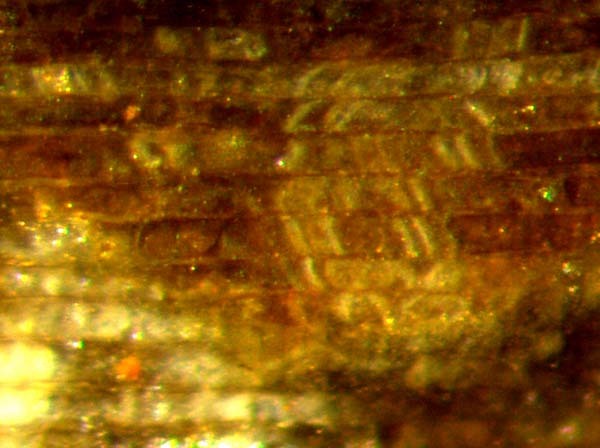 Fig.1: Lateral view on an array of coniferous wood tracheids exposed on an old fracture face on the surface of a piece of petrified wood, with enigmatic silicification phenomena affecting several tracheids simultaneously. Image width 0.7mm. One of the cracks which had shaped the fragment by breaking a petrified tree trunk to pieces had felt the wood structure and was guided along an array of tracheids such that it looks as if it had been cut this way on purpose. 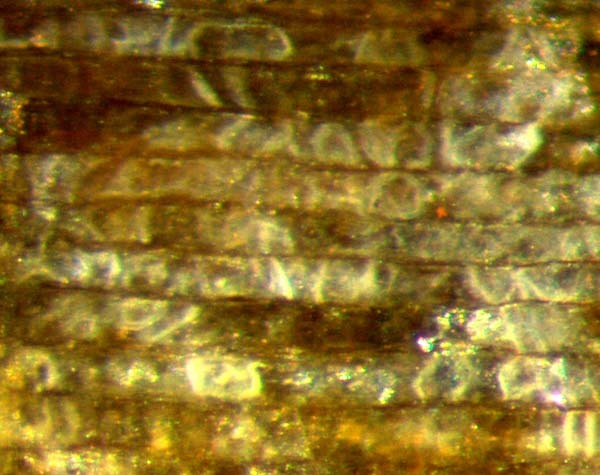 The horizontal dark lines separate the wood tracheids with diameters of about 50µm. In the corner above left there are a few cells of a cut-off pith ray which are not relevant here. Obviously all the conspicuous bright-coloured slabs and angular objects seen in the tracheids do not belong there. Their periodicity could possibly be due to changing outer parameters (temperature etc.) or to intrinsic dynamics of the silicification process. 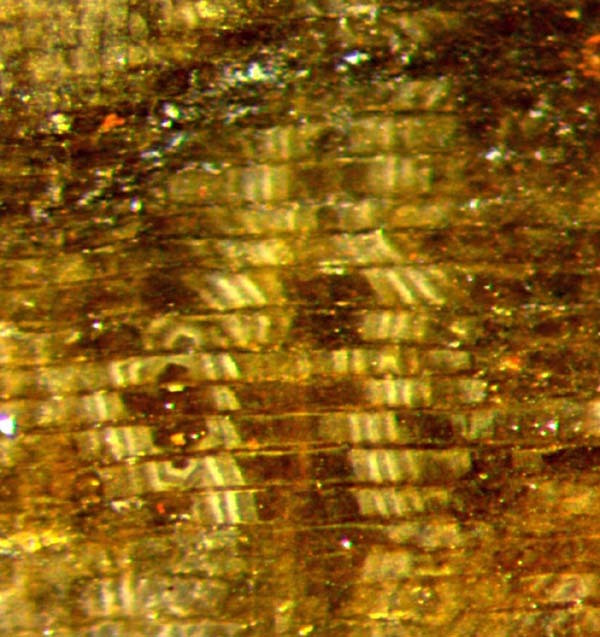 Judging from some similarity with the well-known white spots on silicified wood cross-sections (Fossil Wood News 2) it can be tentatively assumed that the process is triggered by substances released from live or decaying organisms in the wood, possibly fungus hyphae or microbes. (1) Affected are not any tracheids but neighbouring ones only, with the affected sections of the tracheids mutually adjoining. (2) Every affected section of a tracheid consists of a dark or transparent centre and a bright-coloured region above and below (right and left in this image). These two regions are obviously correlated: equal number and tilt of plates in either region inside the tracheid. (3) Angular objects instead of plates seem to be miraculously correlated across 5 tracheids. The following images are thought to provide complementary evidence without providing a way towards an explanation. Fig.2 (right): similar as Fig.1, tracheids slightly wider, with silicification products seen mutually correlated within and without. Image width 0.7mm. Fig.3 (left): similar as Fig.1, tracheids wider, upright and tilted plates inside tracheids reduced in favour of bag-like structures making use of tilted plates and angular elements. Image width 0.7mm. So it appears that the present contribution presents another enigmatic observation but no explanation. Sample: collected at Borxleben gravel pit with the permission by W.+G. Etzrodt, 1995.